Earth Rider Brewery in Superior hosted a unique educational experience on March 9 to commemorate International Women’s Day. Womxn beer professionals and beer enthusiasts were invited to participate in a special brew day. Earth Rider Lead Brewer Allyson Rolph led the brew. Rolph said the intention was to provide an environment that is inclusive and inviting, where it is safe for those not well represented in the brewing industry to ask questions. The brew day was a collaborative effort that includes members of the Barley’s Angels Duluth-Superior women’s beer education group as well as members of the Harbor City Roller Derby team. The Roller Derby IPA will eventually benefit the Twin Ports’ and Northern Minnesota’s original women’s flat track roller derby league. “I’m happy we are able to sponsor and support a diverse and empowering group like the Harbor City Roller Derby team with a portion of the sales of this beer,” said Rolph. The beer features a special Yakima Chief Hops “Pink Boots Blend” (Loral, Glacier, Mosaic, Simcoe, Sabro). The purchase of these hops supports the Pink Boots Society Scholarship Fund, which provides female beer-industry professionals with educational opportunities to advance their careers. Thank you for supporting and inspiring Earth Rider Brewery during our first year! Earth Rider Fest was a great way to celebrate. Cheers! Paddles up! Team Earth Rider had an awesome time at the Lake Superior Dragons Boat Festival. It was an honor to be the official beer and see Dragon Boat Ale enjoyed by so many. Here’s a snippet of our day. Whew! What an All Pints North that was. Earth Rider and Dangerous Man Brewing Co had an awesome time releasing two collab brews together called The Crisp High Five. Here’s a snippet of our day. New Belgium Brewing Brewmaster Chris Holbrook collaborated with Earth Rider’s Director of Brewing Frank Kaszuba to craft the Norseman Ale. The Norseman was brewed with a Norwegian yeast strain and Wisconsin cranberries. The result was a unique twist on a crushable ale. Hold fast. I really wish I had a picture of Frank’s response upon walking into the National Building Museum. The 70-foot tall, eight-foot diameter Corinthian columns draw your eyes up to the clerestory windows. Earth Rider’s Director of Brewing, Frank Kaszuba, put his hand on his head, leaned back as he looked up, and sighed “WOW.” It was mind blowing. The building is amazing inside and out. The art-major part of me loved the architectural details including the Doric, Ionic and Corinthian Columns in the Great Hall and the 1200-foot long terra cotta frieze around the entire outside of the building. Our beers were well received with many positive comments about bringing a lager. In a hall full of sours, wood aged, IPAs, and experimental beers, our Helles stood out as clean, well made, and refreshing. I was pleasantly surprised by the food paired with our beers. Precious Material (Munich Helles) was paired with chile relleno, asadero, and pine nuts. I followed the directions, “let the bite sit for a second, then use the beer to push the heat of the pepper to the roof of the mouth and the crisp carbonation to the bottom.” What an incredible palate pleaser! The light malt sweetness of Precious Material worked perfectly with the spice in the Chile Relleno. Superior Pale Ale (American Pale Ale) was paired with chicken roulade, fennel, and tarragon. The soft notes from the fennel and tarragon played off the Citra and Denali hops, bringing the bite to a clean finish. Incredible. As a brewer I have poured at a lot of festivals and events but this was something special. The Brewers Association has put together the total package with every detail covered impeccably. The Chefs made amazing pairings, the support staff were excellent and organized, and the attendees were truly interested in the beer and the pairings. Several people I talked to said this was their big annual beer event that they look forward to every year and many even travel to Washington DC just to attend. And why not? This is an opportunity to taste offerings from breweries from all over the country that you may not find otherwise. Even independent breweries that distribute nationally brought rare and specialty beers. My favorite pairing? Crooked Stave’s Origins (Wood-Aged Sour) paired with compressed melon and cucumber panzanella. The description was spot on: “Intense melon flavors combine with sour notes from the beer to refresh and awaken the palate.” The salad was bright and refreshing and worked super well with the beer’s tartness and oak. If you are a fan of beer and palate-pleasing fare, SAVOR is well worth the trip to Washington, DC. 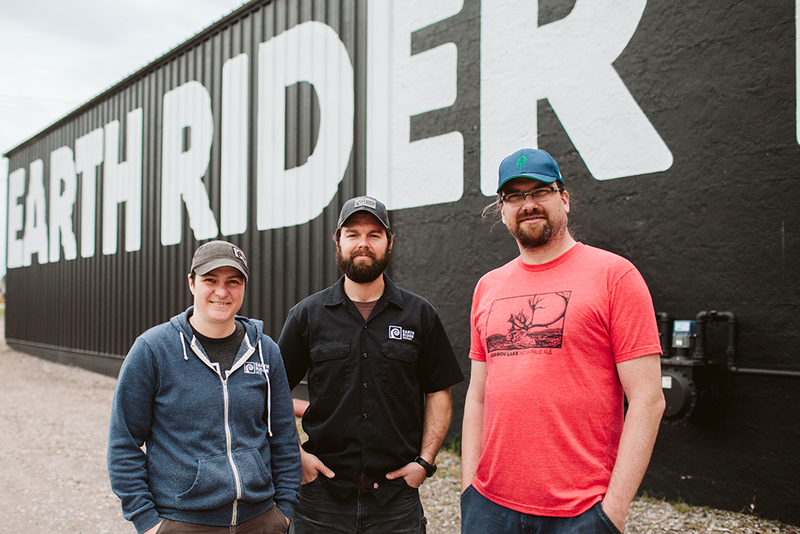 Minneapolis-based Minnesota beer mag, The Growler, featured Earth Rider’s brewing team in the June issue. Earth Rider Brewery’s Rule of Three: Allyson Rolph, Tim Wilson, and Frank Kaszuba introduces readers to each individual brewer and examines how they effectively mesh their strengths to make world-class beer in the Twin Ports. Meet Earth Rider woodcut artist Nick Wroblewski. Nick carved the art featured on Earth Rider cans and boxes. Learn more about Nick and an old-world art form. Earth Rider Brewery claimed a bronze award in the 2018 World Beer Cup, a global beer competition that evaluates beers from around the world and recognizes the most outstanding brewers and their beers. Awards were given in 101 beer-style categories during the World Beer Cup award ceremony on May 3, 2018 at Music City Center in Nashville, Tenn.
Earth Rider was awarded a bronze award in the Oatmeal Stout beer style category for its North Tower Stout, an ale with malty accents ofchocolate, coffee, and dark fruit balanced with a restrained hop presence. “A lot of things have to go right to make beer worthy of an award at the World Beer Cup. This accolade is a testament to the knowledge and attention to detail of our brewing team,” said Tim Nelson, founder of Earth Rider Brewery. World Beer Cup winners were selected by an international panel of 295 beer judges from 33 countries, 72 percent of whom were from outside the United States. Widely regarded as the “Olympics of Beer,” the World Beer Cup saw an impressive field of 8,234 entries from 2,515 breweries in 66 countries—the largest competition to date. Presented by the Brewers Association, the World Beer Cup has been held biennially since 1996 to celebrate the art and science of brewing by recognizing outstanding achievement. For additional information, visit the World Beer Cup website. One of the exciting things about being a brewer is being able to occasionally brew with your friends from other breweries. Chris German and I go way back to the early 2000s when he was doing radio sales and I was getting my start in the Duluth brewing scene. He used to buy malt and hops from us after the local home-brew supply store went out of business. Then he got his big break and took a sales job with Brewers Supply Group, then a fledgling company that has since blown up. Chris and I were discussing what we wanted to brew and he mentioned he had access to some Moutere hops from New Zealand that might be fun to play with. They are a new variety with a very limited supply. When we rubbed the hops to assess their aromatics, we got a lot of stone fruit, cherry in particular. Chris really wanted to throw some rye into the mix, to see how the spiciness of the rye would play against that cherry hop background. Hence the idea of a rye IPA with a fun New Zealand hop was born. Chris came up on a snowy early March day to help brew the beer. We had decided to name the beer after the Edward Ryerson, an ore ship that has been moored behind the Cedar Lounge for quite some time. the Ryerson has been described as one of the most beautiful ore carriers on the Great Lakes. The brew day went smoothly and we eagerly awaited to see what the results of fermentation would produce in this beer. Edward Ryerson IPA is golden in color with a bready malt character made spicy by the use of rye malt. Even though we only used one hop variety, there is a lot of hop complexity in this beer. The prominent hop flavors include cherry, pineapple and pine or resin. Edward Ryerson IPA is now pouring at the Cedar Lounge and at select Twin Ports retail locations. Get a taste of this complex IPA while you can. Earth Rider has started a tart series of beer with a rotating fruit expression, also known as the Earth Rider Crush series. RaspbeCrush is an off-shoot of our ApriCrush, the first release in this series. Earth Rider tart beers have a light, bright, and crisp acidity that is reminiscent of a shandy with a built-in fruit flavor and aroma. The base beer is an American wheat beer with low-to-no yeast expression—the tartness comes from half of the batch being kettle soured and fruit puree is added during fermentation. For those not familiar with kettle souring, we add lactobacillus to the first turn (or first half) of the brew and hold it warm long enough to allow the bacteria to create lactic acid. Lactic acid is the main source of acidity enjoyed in most soured and tart beers. Once the tartness is achieved, we boil the wort (unfermented beer) to kill off the bacteria to prevent risk of contaminating any other beers. We call our Crush series tart, not sour, because it’s a more accurate description of the flavor and also, as a mixed fermentation brewery, we don’t want to confuse our tart brews with our truly sour (mixed fermentation) beers that will be released in the future. Our kettle-soured beers go through our regular-ale fermentation process that takes about two weeks while mixed fermentation is a very complex process that usually takes place in wood barrels and is a mix of both intentionally added bacteria and multiple yeasts. These beers take many months to many years to mature— keep an eye out for those Earth Rider releases. Being able to do a tart series of beer has been a fantastic experience. Being a passionate brewer of sour, tart and clean beers, I love that I can be a part of creating so much variety at Earth Rider. Raspbecrush has many hundreds of pounds of raspberry puree in each 40BBL batch. Look for big raspberry aroma and flavor. I am very excited to share the beautiful red color, raspberry aroma, and bright tart acidity with you. Cheers! Earth Rider Beer is now available in 12 oz. cans at bottle shops, restaurants, and taverns. Now you can enjoy Earth Rider at more places—including your own home! Cans of Earth Rider can be purchased now from retail partners throughout the Twin Ports with distribution expanding by summer to include the South Shore to Ashland, North Shore to Two Harbors, and other points within the Lake Superior watershed. Four Earth Rider flagship styles will be packaged initially: Superior Pale Ale, North Tower Stout, Precious Material Helles, and Caribou Lake IPA.